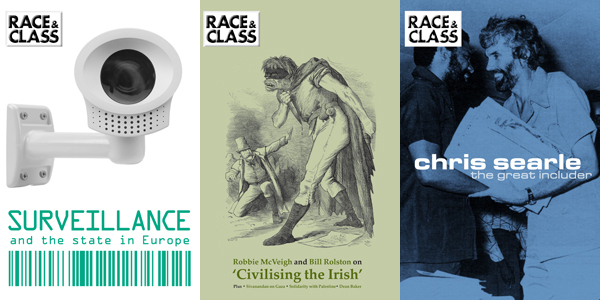 Race & Class is a meeting place for ideas, with an active and involved readership. And, in a climate tending to ever subtler restriction of dissenting views, it offers a platform for radical, informed and liberatory scholarship. 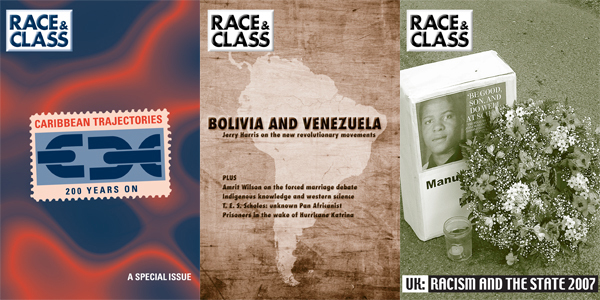 The quarterly journal of the Institute of Race Relations, Race & Class came into being during the early 1970s, at a period of rapid, mass, social and political change; of major liberation struggles and the installation of popular governments in some of the newly independent countries of what was then termed the Third World; of the transformative and exemplary phenomenon of Black Power; of the movement of non-aligned nations. Describing itself then as a journal for Black and Third World Liberation, Race & Class, under its founding editor A. Sivanandan, opened its pages to radical scholars and activists. And, before the journal was five years old, so closely involved were some of its contributors in the liberation movements they wrote of, three of them – Orlando Letelier, Malcolm Caldwell and Walter Rodney – were killed in the front line of struggle. Globalisation and the unprecedented rate of change it unleashes: See, e.g, special issue ‘The Threat of Globalism’ (March 1999) with contributions from John Berger, Angela Davis (interviewed by Avery Gordon), A. Sivanandan, Liz Fekete, Arun Kundnani, Ruth Wilson Gilmore, Walden Bello, Jerry Harris, Jonathan King and Doreen Stabinsky; Jeremy Seabrook, ‘The soul of man under globalism’ (April 2002) Jim Davis, ‘Speculative capital in the global age’ (January 2003) William I. Robinson, ‘”Aqui estamos y nos vamos!” Global capital and immigrant rights’ (October 2006); Justin Conlon, ‘Sovereignty vs human rights or sovereignty and human rights?’ (July 2004) Trends in globalisation are presciently indicated in Jerry Harris’s ‘Emerging Third World powers: China, India and Brazil’ (January 2005) and his later ‘Going green to stay in the black: transnational capitalism and renewable energy’ (October 2010). 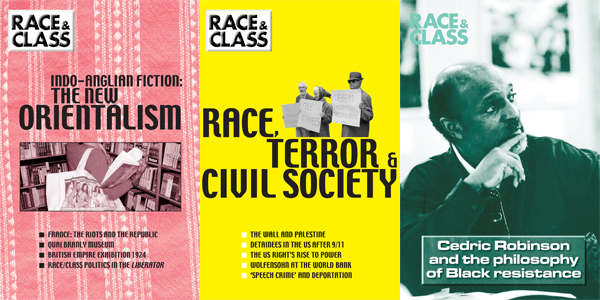 The changing nature of racism: Crucial analyses chart the shifts in British and subsequently European racism, beginning with A. Sivanandan’s ground-breaking ‘Race, class and the state; the black experience in Britain’ (April 1976) which profoundly altered the subsequent direction of the debate; his ‘RAT [Racism Awareness Training] and the degradation of black struggle’ (April 1985) and, among others, ‘Poverty is the new Black’ (October 2001). The diversity of approach and subject matter on this theme can only be indicated here. 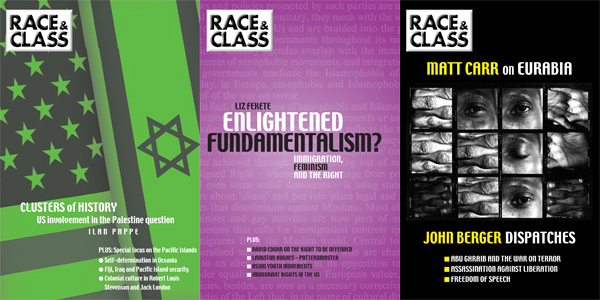 See, e.g., Liz Fekete’s seminal ‘The emergence of xeno-racism’ (October 2001); Dave Renton, ‘Examining the success of the BNP, 1999-2003’ (October 2004); Jonathan Burnett, ‘Community cohesion and the state’ (January 2004); John Wrench, ‘Diversity management can be bad for you’ (January 2005). Examples for Europe include Peo Hansen, ‘In the name of Europe’ (January 2004); Hartwig Pautz, ‘The politics of identity in Germany: the leitkultur debate’ (July 2004); Naima Bouteldja, ‘Integration, discrimination the Left in France: a roundtable discussion’ (January 2008); Graham Murray, ‘France, the riots and the republic’ (April 2006); Carl-Ulrik Schierup and Aleksandra Ålund, ‘The end of Swedish exceptionalism? Citizenship, neoliberalism and the politics of exclusion’ (July 2011). Further afield, see, for example, ‘Multiculturalism in Brazil, Bolivia and Peru’ (Felipe Arocena, April 2008); ‘Antiracist activism in Ecuador: Black-Indian alliances’ (Adam Halpern and France Winddance Twine, October 2000); ‘Racial conflict in Malaysia; against the official history’ (Kua Kia Soong, January 2008); ‘What caused the Cronulla riots?’ (Scott Poynting, July 2006). Cultural imperialism: One of the earliest pioneers in this area was Jack Stauder’s ‘The “relevance” of anthropology to colonialism and imperialism’ (January 1974), followed by Susantha Goonatilake’s ‘Imperialism and development studies’ (October 1974); Edward Said’s, ‘Orientalism reconsidered’ (October 1985) stands out, while George Gherverghese Joseph took this approach into the hard sciences with ‘Foundations of Eurocentrism in mathematics’ (Winter 1987) and ‘Cognitive encounters in India in the age of imperialism’ (January 1995). Later examples are Sarah Amato’s, ‘Quai Branly museum: representing France after empire’ (April 2006) and Anis Shivani’s ‘Indo-Anglian fiction; the new Orientalism’ (April 2006). Postcoloniality: At the intersection of literature and politics is Aijaz Ahmad’s pioneering ‘The politics of literary postcoloniality’ (January 1995), bookended to date by Neil Lazarus’s wide-ranging ‘What postcolonialism doesn’t say’ (July 2011). Even earlier was Tim Brennan’s ‘Cosmopolitans and celebrities’ (July 1989) and Edward Said’s ‘Figures, configuration, transfigurations’ (July 1990). More specific in focus, but not in reach, are A. Sivanandan’s ‘The enigma of the colonised: reflections on Naipaul’s arrival’ (July 1990); Andrew Smith’s, ‘Ben Okri and the freedom whose walls are closing in’ (July 2005); Rehana Ahmad’s, ‘Brick Lane a materialist reading of the novel and its reception’ (October 2010) and David Edgar’s thought-provoking analysis of censorship, ‘Shouting fire: art, religion and the right to be offended’ (2006). The nature of the state, migration and asylum issues: See Bill Rolston and Robbie McVeigh’s brilliantly original analysis, ‘From Good Friday to Good Relations: sectarianism, racism and the Northern Ireland state’ (April 2007) and their subsequent ‘Civilising the Irish’ (July 2009). The development of UK policy on race is the subject of Jenny Bourne’s ‘The life and times of institutional racism’ (October 2001). Recent analyses of ever-changing migration policies include Frances Webber’s, ‘How voluntary are voluntary returns?’ (April 2011) and Liz Fekete’s, ‘Accelerated removals: the human cost of deportation policies’ (April 2011). See also her earlier ‘The deportation machine: Europe, asylum and human rights’ (July 2005) and, with Frances Webber, ‘Europe: from refugee to terrorist’ (October 1996). Examples further afield are Harsh Walia, ‘Transient servitude, migrant labour in Canada and the apartheid of citizenship’ (July 2010) and Sunera Thobani, ‘Closing ranks: racism and sexism in Canada’s immigration policy’ (July 2000); Kamala Kempadoo, ‘The war on human trafficking in the Caribbean’ (October 2007) and Shahram Khosravi, ‘Sweden: detention and deportation of asylum seekers’ (April 2009). The ‘war on terror’ and the assault on civil rights: Since Bush’s declaration of a ‘war on terror’ following 9/11, Race & Class has explored its implications from a variety of angles, both the domestic and the global. Notable are Victoria Brittain’s, ‘Besieged in Britain’ (January 2009) on detainees under control orders and Barbara Harlow’s survey of the huge and expanding literature on GITMO, ‘”Extraordinary renditions”: tales of Guantanamo’ (April 2011). Liz Fekete’s, ‘Anti-Muslim racism and the European security state’ (July 2004) analysed early on its interplay with national and EU-wide policy and Magnus Hörnqvist, ‘The birth of public order policy’ looked at the implications for the nature of the state (July 2004). A. Sivanandan, ‘Race, terror and civil society’ (January 2006) and Avery Gordon, ‘Abu Ghraib, imprisonment and the war on terror’ (July 2006) explored the war’s reach, and Shubh Mathur, ‘Surviving the dragnet: “special interest” detainees in the US after 9/11’ (January 2006) looked at those caught up in it. ‘The Terrorism Act 2000: an interview with Gareth Peirce’ (October 2001) presaged the development of the UK’s draconian measures. Neil Macmaster, ‘Torture: from Algiers to Abu Ghraib’ (October 2004) related torture’s modern use back to colonial methods. 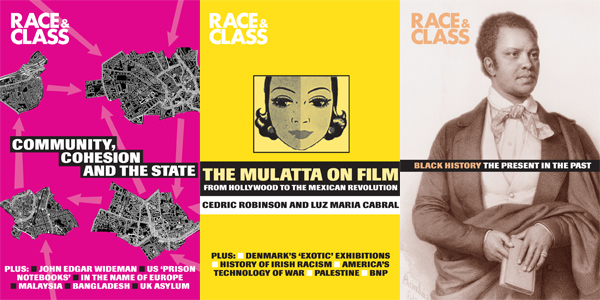 Black politics and Black history: A number of special issues on these themes have been published: (‘Black history: the present in the past’ (2003); ‘Black America: the street and the campus’ ; the seminal ‘From Resistance to Rebellion’ on the UK’s 1981 ‘riots’. Race & Class has explored debates around and within black politics, from A. Sivanandan’s ‘The liberation of the black intellectual’ (April 1977) onwards. See, for example, Manning Marable ‘Rethinking Black liberation; towards a new protest paradigm’ (April 1997) and his ‘Black fundamentalism: Farrakhan and conservative Black nationalism’ (April 1998); Barbara Ransby, ‘US: the Black poor and the politics of expendability’ (October 1996); Cedric J. Robinson, ‘Blaxploitation and the misrepresentation of liberation’ (July 1998); Joäo Costa Vargas, ‘The inner city and the favela: transnational Black politics’ (April 2003); Joy James ‘American prison notebooks’ (January 2004) and Michael T. Martin and Marilyn Yaquinto ‘Reparations for “America’s Holocaust”: activism for global justice’ (April 2004). On Afrocentricity, see Sidney J. Lemelle, ‘The politics of cultural existence: Pan-Africanism, historical materialism and Afrocentricity’ (July 1993) and Christopher Williams, ‘In defence of materialism; a critique of Afrocentric ontology’ (July 2005). One important aspect of Race & Class is the stress it has laid on the reclaiming of lost or hidden histories, as in Aaron Kamugisha’s masterly ‘Finally in Africa? Egypt, from Diop to Celenko’ , (July 2003) looking at the racist historiography that even today bedevils the academic study of Africa, while A. Sivanandan’s ‘From resistance to rebellion: Asian and Afro-Caribbean struggles in Britain’ established the core narrative of post-war Black British history (October 1981). 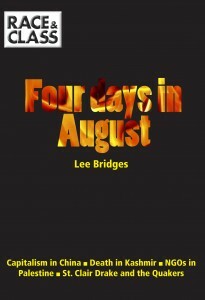 Individual subjects have included the black tragedian Ira Aldridge, the early pan-Africanist T. E. Scholes, Claudia Jones, an encounter with Paul Robeson and W. E. B. DuBois, the historian and writer Edward Scobie, among others. Accepted narratives have been examined in new ways, as in Marika Sherwood’s, ‘Britain, the slave trade and slavery, 1808-1843’ (October 2004) which documented Britain’s semi-covert continuing involvement in the trade after abolition and Horace Campbell’s ‘Rastafari: culture of resistance’ (July 1980). Colonial imperialism and liberation struggles: The re-examination of the colonial record is exemplified in John Newsinger’s ‘Liberal imperialism and the occupation of Egypt in 1882’ (January 2008) and his ‘Counter-insurgency tale: Kitson in Kenya’ (April 1990). Jeremy Seabrook, ‘The living dead of capitalism’ (January 2008) examines the effect on those who formerly served the empire. From the opposite vantage point, and often very close to the events, see Helen Lackner, ‘Revolution in the Gulf’ (April 1974); Elaine Capizzi and others, ‘Fretilin and the struggle for independence in East Timor’ (April 1976); Jay O’Brien, ‘Tribe, class and nation: revolution and the weapon of theory in Guinea-Bissau’ (July 1977); A. Yusuf, ‘Resurgence of the Arab right wing and the liberation movements’ (January 1976); Basil Davidson, ‘On revolutionary nationalism: the legacy of Cabral’ (January 1986). More recent are Dan Connell, ‘After the shooting stops: revolution in postwar Eritrea’ (April 1997); Nancy Murray, ‘Somewhere over the rainbow: a journey to the new South Africa’ (January 1997) and Jerry Harris, ‘Bolivia and Venezuela: the democratic dialectic in new revolutionary movements’ (July 2007). Victoria Brittain, ‘They had to die: assassination against liberation’ (July 2006) documents the use of one of the weapons deployed against strugglers for freedom. 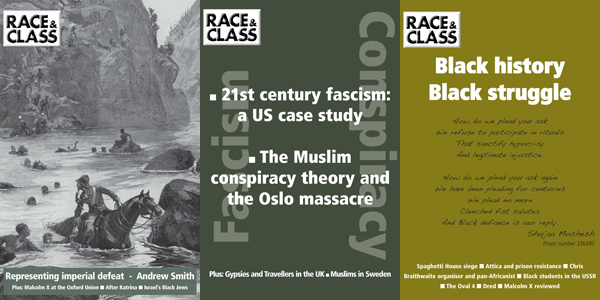 Islamophobia and anti-Muslim racism: Race & Class has been at the forefront of such analysis, including Arun Kundnani’s ‘Islamism and the roots of liberal rage’ (October 2008) and his ‘Integrationism: the politics of anti-Muslim racism’ (April 2007). Liz Fekete’s ‘Enlightened fundamentalism? Immigration, feminism and the Right’ (October 2006) broke new ground. Matt Carr explored the intellectual Right’s contemporary myth-making with ‘You are now entering Eurabia’ (July 2006). 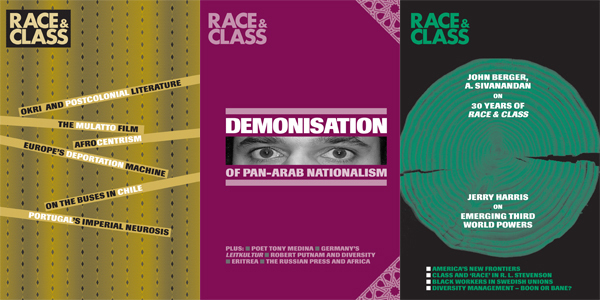 Other examples are Gholam Khiabany and Milly Williamson ‘Veiled bodies – naked racism: culture, politics and race in the Sun‘ (October 2008); Sabine Schiffer and Constantin Wagner, ‘Anti-Semitism and Islamophobia – new enemies, old patterns’ (January 2011). Palestine/Israel and the wider Middle East: Race & Class has consistently covered the Middle East, and Palestine/Israel in particular, with a distinguished roll-call of writers that includes Naseer Aruri (‘United States policy and Palestine: Oslo the Intifada and erasure’ January 2011); Ilan Pappe (‘Clusters of history: US involvement in the Palestine question’, (January 2007); Edward Said, ‘Spurious scholarship and the Palestinian question’ (January 1988) and Ehud Ein Gil and Moshe Machover’s ‘Zionism and Oriental Jews: a dialectic of exploitation and cooptation’ (January 2009). 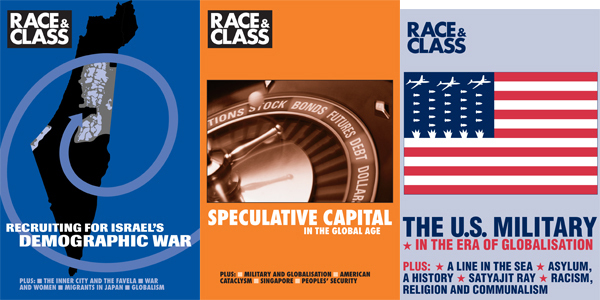 Eqbal Ahmad wrote in and edited a number of early special issues, including Race & Class‘s first ‘The US and the Arab world’ (Winter 1976) also influential was Israel Shahak’s ‘Israeli apartheid and the Intifada’ (July 1988). Wider afield is Ralph M. Coury’s ‘The demonisation of pan-Arab nationalism’, (April 2005) and Rosemary Sayigh’s, ‘Palestinians in Lebanon’ (October 1995). Joel Beinin identified ‘The new American McCarthyism: policing thought about the Middle East’ (July 2004) The boycott movement was the subject of Abigail B. Bakan and Yasmeen Abu Laban’s ‘Palestinian resistance and international solidarity’ (July 2009) and Hilary and Steven Rose’s ‘Israel, Europe and the academic boycott’ (July 2008). The political, economic and social impacts of the technological revolution: Examples are A. Sivanandan’s seminal ‘Imperialism and disorganic development in the silicon age’ which, as far back as 1979, saw what the revolution in information technology had made possible for imperialism; a theme that has continued in his subsequent far-reaching analyses of today’s information society and the transition from the welfare state to the market state. It was followed by his ‘New circuits of imperialism’ (April 1989) and ‘Heresies and prophecies: the social and political fall-out of the technological revolution’ (April 1996). Also important are Jim Davis and Michael Stack’s ‘Knowledge in production’ (January 1993) and Jerry Harris’s far-sighted ‘Information technology and the global ruling class’ (April 2001). Modern warfare: For wide-ranging coverage of both the deployment of military power and its sophisticated technology, see, e.g., Sohan Sharma and Surinder Kumar, ‘The military backbone of globalisation’ (January 2003); Jerry Harris, ‘The US military in the era of globalisation’ (October 2002); Arun Kundnani, ‘Wired for war: military technology and the politics of fear’ (July 2004); Matt Carr, ‘Slouching towards dystopia: the new military futurism’ (January 2010) and ‘The barbarians of Fallujah’ (July 2008); Peter Custers, ‘Military Keynesianism today: an innovative discourse’ (April 2010). The information society: See Tony Bunyan, ‘Just over the horizon – the surveillance society and the state in the EU’ (January 2010); among many prescient contributions by A. Sivanandan is his ‘Racism and the market state’ (April 2003). Nancy Murray’s ‘Profiling in the age of total information awareness’ (October 2010) is a chilling indictment; Arun Kundnani, ‘Where do you want to go today? The rise of information capital’ (March 1999). 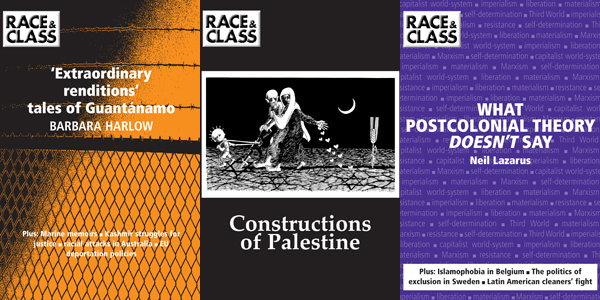 Among the roll-call of Race & Class‘s contributors past and present are (in no particular order) Eqbal Ahmad, Angela Davis, John Berger, Avery Gordon, Edward Said, David Edgar, Noam Chomsky, Tim Brennan, Barbara Harlow, Neil Lazarus, Basil Davidson, Walden Bello, Ilan Pappe, Victoria Brittain, Cedric Robinson, Barbara Ransby, Chris Searle, A. Sivanandan, Liz Fekete, Arun Kundnani, Thomas Hodgkin, Marwan Barghouti and Manning Marable. What all the writers and articles listed above share is an underlying belief that ‘the function of knowledge is to liberate … to apprehend reality in order to change it’ (from the editorial, April 1974). That has been the guiding principle of Race & Class ever since, one consequence of which is that the journal has always attempted to convey its arguments in language that is clear, jargon-free and precise, and as accessible as possible to its users. 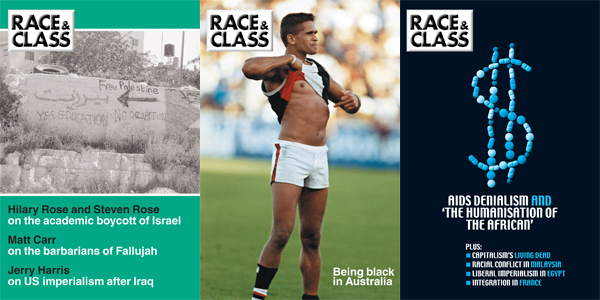 It has also meant that Race & Class eschews articles that simply think about thinking, that explore ‘discourse’ or abstract concepts without reading back to lived experience. In the process, what has evolved is a journal that is truly multi-disciplinary. 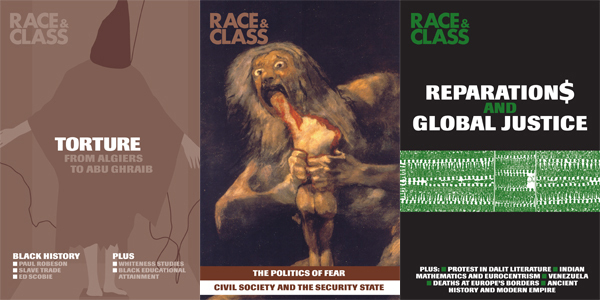 Race & Class crosses boundaries, between, for example, the development of scientific knowledge and the social history of racism, or between the historical and contemporary politics. 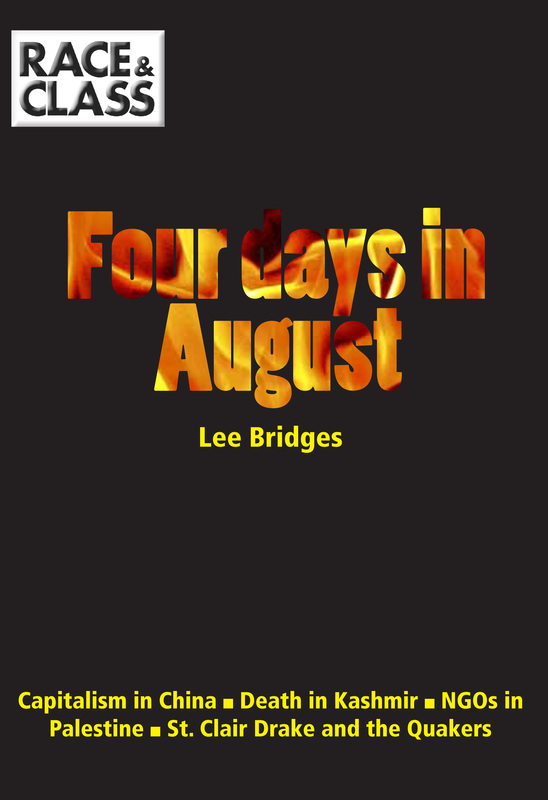 This type of cross-over has been particularly exemplified in the special issues of the journal, whether devoted to the achievements of one person connected to Race & Class, one theme, or one country. ‘”A world to win”: essays in honour of A.Sivanandan’ was published in July 1999 with contributions from scholars such as Aijaz Ahmad, Timothy Brennan, Neil Lazarus, Jerry Harris, Jan Carew, Bill Rolston, Lee Bidges and others. ‘The gentle revolutionary: essays in honour of Jan Carew’ was published in January 2002, with contributions from scholars in the UK, US and the Caribbean. 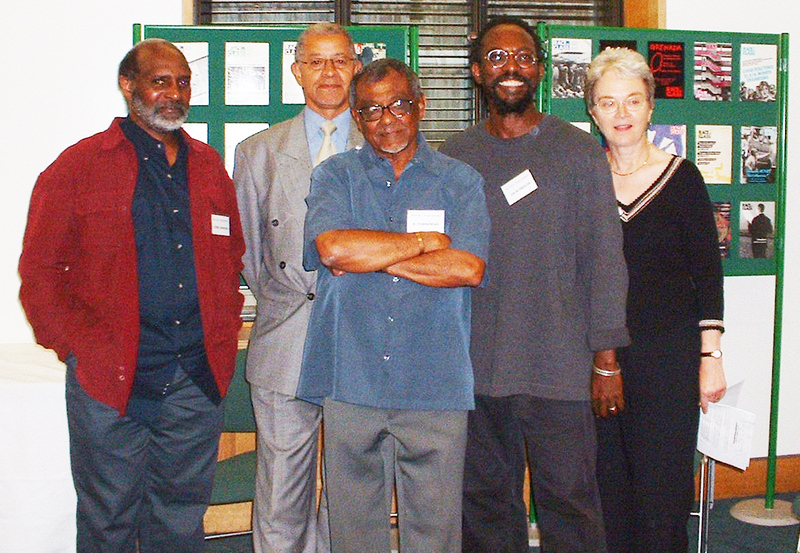 ‘Cedric Robinson and the philosophy of Black resistance’ was published in October 2005, with contributions from past students and present academics, and looked at black scholarship in general. ‘Chris Searle: the great includer’, which was published in October 2009, with contributions from academics and educationalists across three continents, illuminated not just his career but the whole field of radical pedagogy. 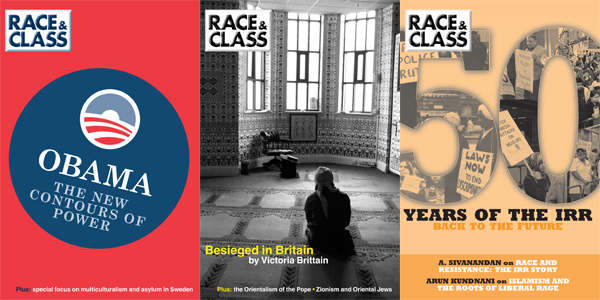 Themed issues have included the following: in October 2001, ‘The three faces of British racism’; in July 2002, ‘”Truth” examining truth and reconciliation commissions’; in July 2003, ‘Black history: the present in the past’. 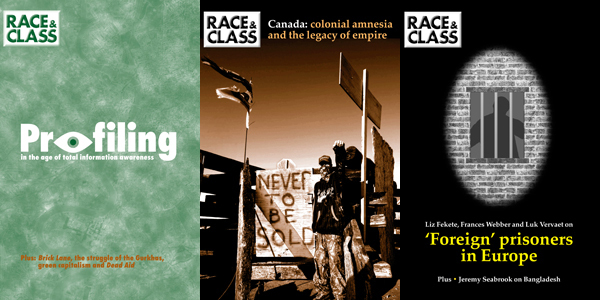 Three more recent special issues have concentrated on one region or country: in October 2007, on the bicentenary of British abolition of the slave trade, ‘Caribbean trajectories: 200 years on’; in July 2010, ‘Canada: colonial amnesia and the legacy of empire’, and, in January 2011, ‘Constructions of Palestine’. But, long before, there were special issues on the Middle East in 1976 following the first invasion of Lebanon in 1982; the rise of the authoritarian state in Sri Lanka. Members of the Editorial Working Committee and the IRR Council of Management celebrate thirty years of Race & Class. From left to right, Cedric Robinson. 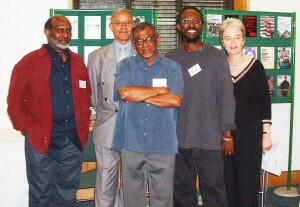 Lord Herman Ouseley, A. Sivanandan, Colin Prescod and Hazel Waters.